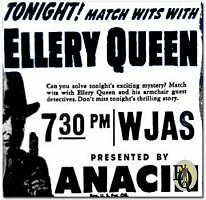 The Saint owed it's debut over Radio to the extraordinary success of the Ellery Queen franchise. 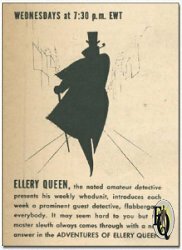 Ellery Queen had become so popular over Radio that it priced itself out of a sponsor. Emerson Drug, the maker of Bromo-Seltzer, decided that it would be more economical for them to abandon their Ellery Queen sponsorship over NBC and inaugurate a new series at a much lower cost. And so it was that Emerson Drug, Leslie Charteris, and producer/agent James Saphier brought the package to air over NBC for a three-month run between January and April 1945. An AFRS Mystery Playhouse program "The Diamond Fence"
mystery that takes place in a shabby rooming house in Greenwich Village. though Sidney Smith (Ellery) doesn't come over with the necessary incisiveness. Barbara Terrell, part being built up on her romance with Ellery. 212* "The Seven Thousand Victims"
lighthouse blinks off and stays off. train speeding from Boston to New York. Mr.Blakeslee had no trouble solving the case. 215* "The Crime in the Snow"
Story of enemy sabotage in war plant. Left: Ellery Queen, the noted amateur detective presents his weekly whodunit, introduces each week a prominent guest detective, flabbergasts everybody. It may seem hard to you but the master sleuth always comes through with a neat answer in The Adventures of Ellery Queen (Add March 1945). of those at 12:30 get the answer wrong: there too honest to listen at 7:30. 219* "The Sword of Damocles"
collection of historic weapons and instruments of torture. collection of lethal instruments to set death traps for him. 223* "The Crime that wasn't Possible"
Program of 4-25 Pre-empted by a United Nations special on the San Francisco conference of the U.N. with President's Truman speech in the plenary session. Postponed until 05-16-45 in several regions. 224* "The Key to the Mystery"
A young man just returned from the war and a hoped-for wedding. in the clue of the dead moths. 227* "The Man in the Pillbox"
230* "The Corpse of Mr.Entwhistle"
232* "Mr. One and Mr. Two"
Sherlock Holmes called "(The Strange Case Of )The Murder In Wax". preserved as Mystery Playhouse (Armed Forces Radio Services) episode. 238* "The Clue in C Major"
239* "The Time of Death"